Example 1: Before David lived overseas, he believed that Americans had the best ideas; now he has become more open-minded and listens to people from different countries. Example 2: These days, people are more open-minded about things like tattoos, gay marriage, and mental illness than they were in the past. Before, people didn't like to talk about them. Nowadays, more people are willing to discuss these topics. 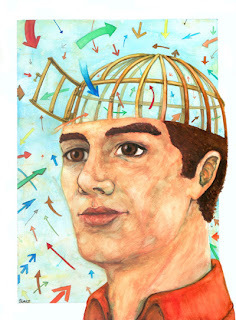 Explanation: when a person is open-minded, they are able to accept different ideas. The opposite is true for closed-minded people, they don't like to learn about and accept new ideas.